About a year and half ago, Alastair Roberts, Andrew Wilson, and I recorded a phone chat we had on a couple of theological topics. We posted it up at Mere Orthodoxy under the title Casting Across the Pond. 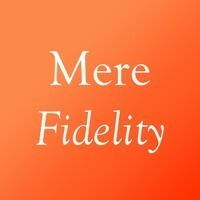 Two weeks later, Matthew Lee Anderson joined the crew and the Mere Fidelity podcast was born. It’s been a joy to the four of us ever since. We hope it’s been a joy for you, our listeners. You all have made it possible for us to keep going. In order to celebrate our 50th episode, we decided to do an “Ask Us Anything” episode. Things included in this discussion: do animals go to heaven? How did the podcast get started? Why do some people use grape juice over wine in communion? And, how is Alastair such a freak when it comes to reading books? We hope you enjoy the show as much as we did. ← Are We Really Just Like Those Who Embraced the Gentiles?